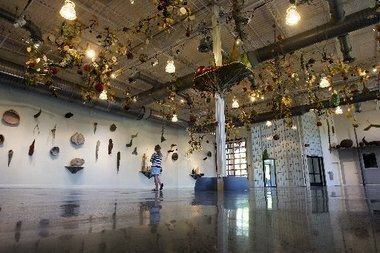 Michael Mancuso/The TimesReplicas of flowers, fruits, vegetables and herbs adorn the walls and ceiling of Grounds for Sculpture's new East Gallery in Ming Fay's installation, "Canutopia." Grounds for Sculpture just keeps coming up with one surprise after another — and it just keeps getting better and better. The latest is the new East Gallery, 10,000 square feet constructed out of pre-existing storage space. It offers an event space, a ticket office, a caterer’s kitchen, restrooms and gallery walls and ceilings that, for its inaugural, sculptor Ming Fay has turned into a veritable organic wonderland. “The curators were meeting with the architects as this was being decided. They were considering things like how light comes into the room and how the space could be used for both two- and 3-D art,” says marketing director Coby Green-Rifkin. The ceiling and walls of the new space are like an explosion of color and imaginative form. “Truckload upon truckload upon truckload brought his work here. It was like a treasure hunt when it all arrived,” Green-Rifkin says. “He sees his work as merging of canopy and Utopia. The re-harmonization of humanity and nature that is inevitable in this century,” says Steel, who, with wide gestures toward the ceiling above, then sweeping to the walls, says Ming Fay’s sculptures are papier-mâché, bronze, wood, sponge, paper, plaster and wire-coated compositions. Visitors approach the new East Wing through the sculpture park’s hedge rooms, where outdoor sculptures are sited. When entering, you see banners representing the Ming Fay exhibition. The walls come alive with his replicas of Chinese roots used in medicine, ling pods that float in the oceans, archeological elements — things that were, such as skulls and roots and branches. Overhead is a world of mobiles created in foam as well as in every imaginable substance that can be molded and shaped to represent nature’s bounty. They move in the air currents, and as they slowly turn you can be held captive finding one surprising shape after another: “Oh, there’s a cherry, a leaf, a seed pod, a spider, a human form!” You could literally spend hours gazing upward and still not identify each and every suspended form. On his website mingfay.com, the artist says, “My sculpture comments on the botanical world and its relationship to humans, ranging from over-sized plant forms to complex overgrown environments reminiscent of science-fiction films.” He borrows from folklore and says he “invents and interprets new cultural context” for his hybrid sculptures. In the new ticket lobby, Ming Fay’s mobiles mingle with necessary architectural elements such as lighting. Featured there are his “monkey balls.” Curator Steel points out holes in the bottom of each pod that represent openings made by monkeys in search of the satisfying nectar within. It’s Ming Fay’s stated belief that we, as humans, long for a lost Utopia. The title “Canutopia” chosen for this exhibition blends his belief that a garden is the symbol of abundance, a Utopia, with the canopy of fanciful flora and fauna that dances and sways from the ceiling of the new East Gallery whose walls, niches and wall platforms hold magical and mysterious forms of nature. “This is an overwhelming visual feast,” says Tom Moran, Grounds for Sculpture’s chief curator and director of artistic development. “This is the biggest exhibit we’ve ever launched, and we have five shows opening Saturday,” Green-Rifkin says. The Education Gallery will feature “The Impact of Art,” a perspective on persons with disabilities, sponsored by the Progressive Center for Independent Living. Other exhibitions will follow Canutopia in the new East Gallery, which is equipped with the latest in theatrical lighting and sound systems for special events — a state-of-the-art space where all events will be surrounded by art.